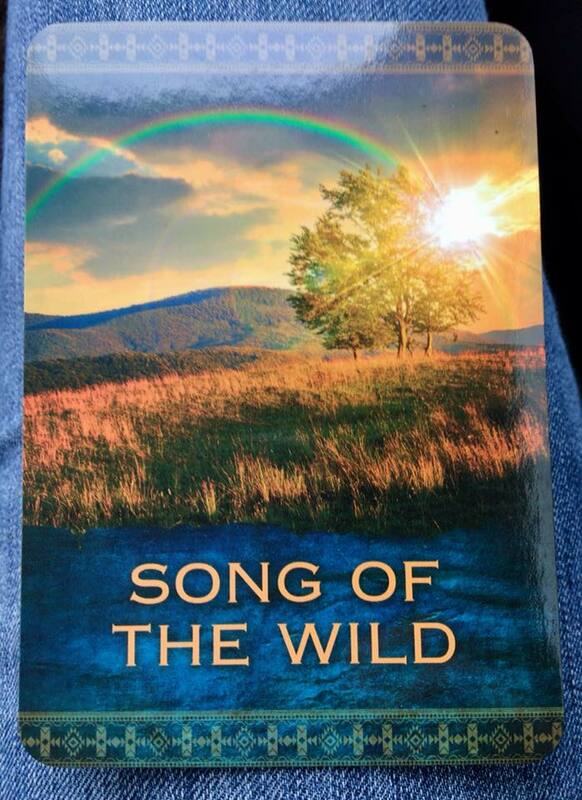 Today’s card speaks to caring for the land and the people over oneself. A rather timely message. We can all do something if willing to make real changes. Meaning: A woman with an Otherworldly air. She is creative with a wealth of artistic ability. A delicate, romantic beauty. A woman who is acutely sensitive to her environment. One who trust her intuitive sense and psychic abilities. A poetic person of vision and intelligence. A realistic woman of strength and integrity. Can represent love and a happy marriage. On the flip side, this card can also represent a dreamer and a show-off. A shallow person with little conviction or honor. One who spouts nonsense and believes herself of superior intellect. Dishonesty and immorality. The Story: The early Celtic people believed that the spirit of the land was personified by the Goddess Sovereignty, who bore the same name as the land she represented. The physical appearance of the Goddess often reflected the landscape and its current state. In the winter months, she appeared as a dirty, weather-worn hag, with hair of lichen and arms and legs that resembled the bare limbs of trees. In the spring and summer she because a fertility, radiant beauty. In many of the old tales, Sovereignty would first appear in her repulsive guise and test the would-be king. If she deemed him worthy of her, she would transform into her floral beauty of spring. The king’s first duty was to the land, and upon taking the crown, the king underwent a solemn ceremony in which he was bound in a sacred marriage to the land – a vow that the welfare of all depended upon. As the story of the Fisher King illustrates, if the king failed his responsibilities or was wounded, Sovereignty would transform into her loathly guise, the land would become barren, and all would suffer until the king was healed or replaced (most often the latter resolved the matter). Britain continues the tradition of having a female figure personify the land (or more recently, the British Empire). Today, she is embodied in the image of Britannia, who is depicted with a helmet, shield, and trident. 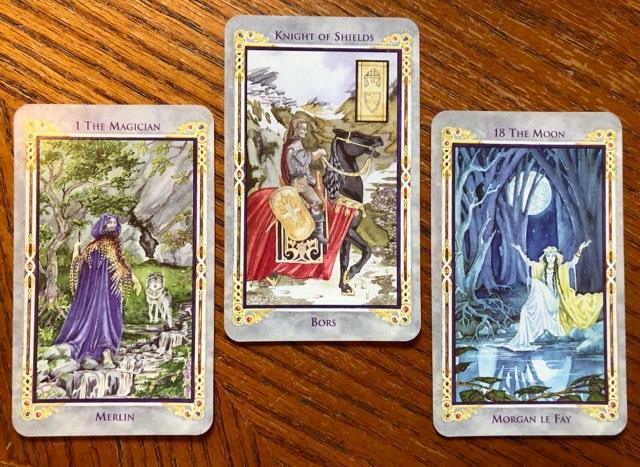 Spread of the Day: Merlin, Bors, and Morgan le Fay, oh my! OK, so today we’re working with the Legend: An Arthurian Tarot deck. Then I pulled three big hitters – and they were all equally strong. In fact, as my hand moved back and forth over these cards, the energy was very smooth and powerful, as if they were working together. I took the hint and posted them as a spread instead of choosing one as a daily card, but I’m sure this spread could be interpreted in multiple ways. Hope this is helpful to someone! So at the center of things we have here a knight who, is considered one of the best knights of Arthur’s Round Table. He, along with Galahad and Percival, took on the quest for the Grail, but he was the only knight to survive and return to court. He balances ambition with compassion. He is dependable and steadfast – the Taurus of the knights, if you will. To either side of him, we have two other very powerful and telling cards. The Magician depicted as Merlin is on the left. The Moon, depicted as Morgan le Fay, is on the right. The Magician represents skill and wisdom, noble use of talent, harmony with one’s environment, having influence, and being a wise counselor. He is aware of his power and will use it, though he will believe it is for the best of all when he does so (whether that is true is another discussion). These are very conscious and crafted traits. The Moon is also powerful and spiritual, but almost the opposite of the Magician in all other ways. She represents emotion, illusion, and the dreams that can influence our waking days. She is sensitive to myth and its archetypes and meaning for us. Introspection and guarding against deception and misguided influence is also called for. She is the subconscious aspect of ourselves. With such a balanced and yet unglamorous knight (at least compared to Percival or his son) at the center and a yin-yang duo on with side, I can’t help but feel that we are being called to seek balance. Are we ignoring our subconscious and our dreams because we are hyper focused on our influence and skills in the day world? Or perhaps the opposite issue is at hand? Getting lost in dreams and interpreting emotions and symbols can make you lose ground on what you, as a spirit here as a human, need to be doing. Whichever feels true for you, this is bigger than a single card suggesting this – these cards were adamant this morning. 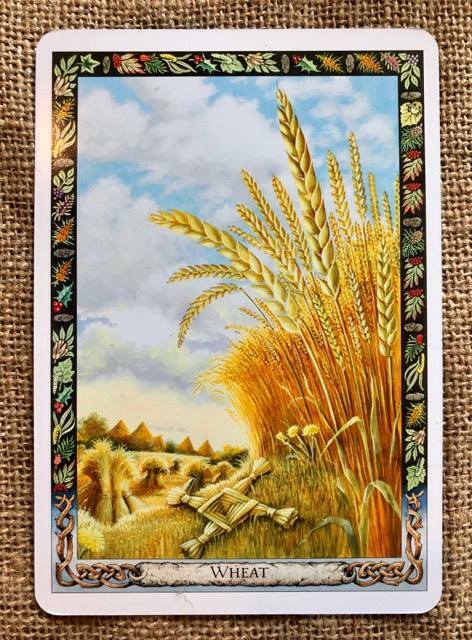 What a fantastic card – and notice that little dandelion in front of the wheat? That’s the nomad and the wheat is the settled farmer. Read to the bottom and note that we both can be incorporated if we are having issues picking a settled or traveled life. Blessings and happy Friday, y’all! Meaning: The time of the harvest is a time of abundance – of appreciation for all that Nature has given us. 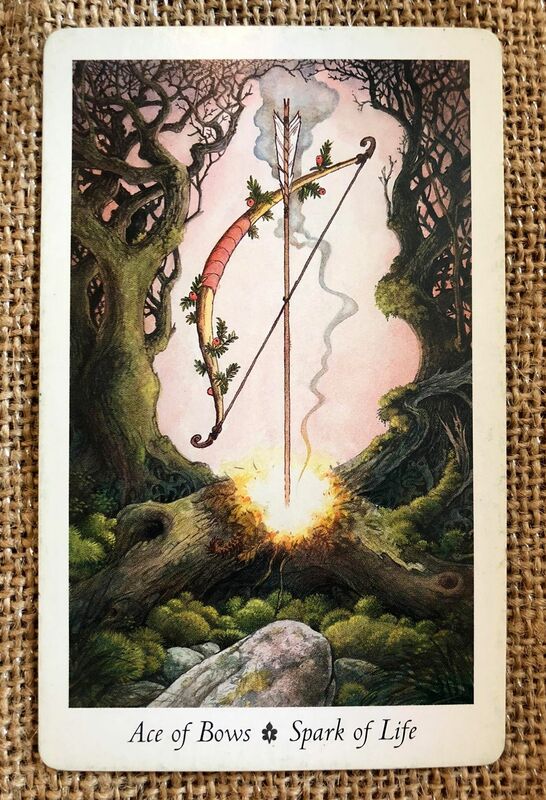 It is also a time for celebrating the results of your hard work, and choosing this card could indicate that it is time to stop working for a while, to take some time to appreciate your achievements and give thanks for the harvest of your life. It may be that you spend a great deal of energy sowing seeds and caring for your plants – working for the future and caring for your family – but it is vital that you also give yourself time to savor life in the moment and to enjoy the family as a community, a tribe, too. This card may also suggest that you are entering a phase of abundance, bringing you riches in your relationships and in your spiritual, creative, and material lives. This is a card that symbolizes generosity: when your needs at a material and emotional level are satisfied, you are then free to focus on the gifts you can give to the world. On the flip side, this card could indicate that you are having trouble settling in one place. You may long to go traveling, or to have a more flexible lifestyle. Or you could be experiencing quite the opposite feeling – you may have been moving often in recent times and now you feel that you need to settle and put down roots. Alternatively, perhaps you are torn between the nomad life, with all the excitement that movement and traveling can bring, and the settled, rooted life, which offers comfort and familiarity. It may help to remember that both the hunter-gatherer and the settled farmer live within us as ancestral archetypes, and that we can honor both at different times of our lives. 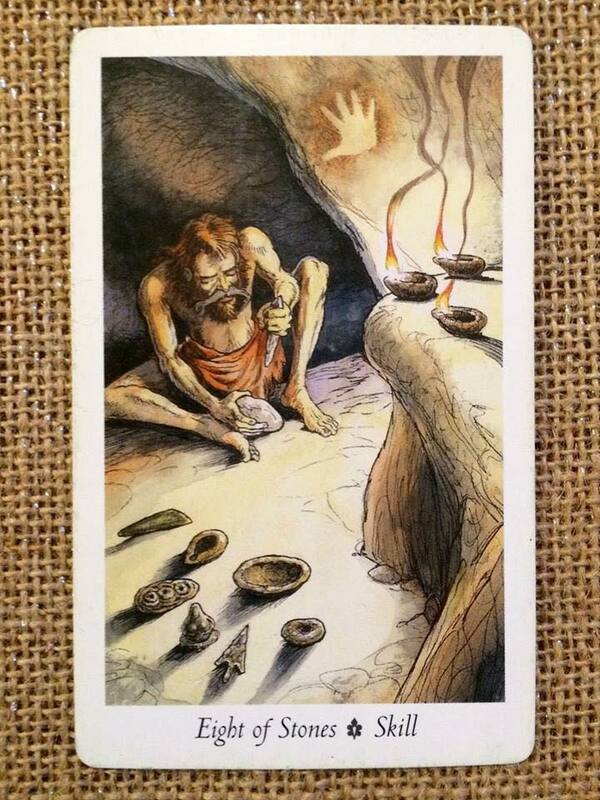 This is a card that has a lot of potential to it – if you put in the time and attention to learn a new skill or put one we have to use. Sometimes it has to do with will, but sometimes we have a block going on making us think we either can’t learn something well or something keeping us from excavating past skills and dusting them off. MEANING: There is an ability to utilize skill for the completion of labors of practical necessity as well as love. Sometimes, intense concentration and dedication are required. DESCRIPTION: A man clad in skins sits in a cave working at a stone carving. Around him on the walls and the ground are seven objects which he has created. To one side is an ancient hand print the signature of the maker. Three rush lamps paint the scene with light and shadow. READING POINTS: Since human beings first walked the Earth, we have honed and practiced our skills in all manner of practical and esoteric arts. We have the awareness and self-discipline to develop new skills to meet new challenges and have overcome nature’s most adverse and deadly conditions. Whether it was the life-saving and practical skills required to track and bring down sometimes dangerous game for food, or the growing and managing of crops for the good of the tribe or village, human beings have continually striven to invent new social frameworks, scientific or philosophical concepts and practical tools and equipment. Such discoveries require us to master new skills for the betterment of the tribe or society. This unique human ability requires patience, perseverance, and – most of all – self-discipline. Acquiring a skill that involves imagination and artistic flair require time spent learning and defining the nature of self-expression. The mastery of any skill requires you to call on the divine to bless thee effort and energy expended in the process. Though spring can be busy with getting gardening and yard projects going, don’t forget to sprinkle in some adventure. It doesn’t have to be expensive – sometimes just a drive on some back roads will do the trick. Meaning: New horizons await you! You are ready to savor the wonders of the world. Take some risks. Answer the call the wild. Step out of your comfort zone and live passionately. Take steps in the direction of freedom. Expand beyond your limitations and boundaries. Maybe it’s time to take a journey or do something new and exciting. Native Spirit Wisdom: You are entering a period of expansion and going beyond your self-imposed limitations. Even if you feel hesitant, this is the time to try something new and do things in a different way. You might even visit far-off lands or wild natural places. Adventure often entails risk but without it, life can be come lackluster and stagnant. I was there’s a vast, new, and wondrous vista just around the corner, but you’ll never see it if you don’t venture out. The Journey: Plan a trip. Take some classes that get you out of your comfort zone. Try new styles. Do the same things that you’ve always done, but in a new and different way. Push beyond your boundaries. Step out of character. Spend time in the wilderness. This is yet another card showing positive potential and good things. 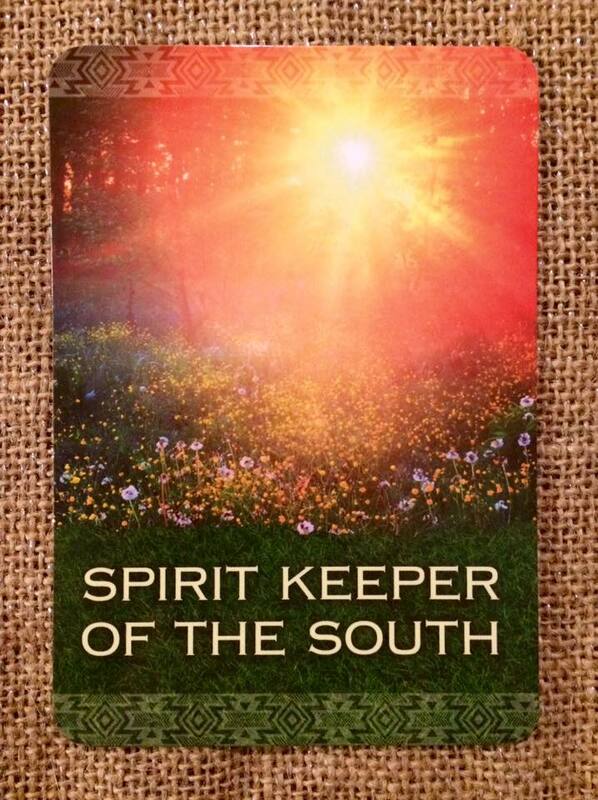 Do note that the other strong card today was Offerings, which suggests that perhaps having more gratitude (or even making literal offerings) may help with making the South’s abundance come to fruition in your life. Meaning: Abundance and prosperity in all forms. Expansion. Surging energy. Activity and movement. Rapid growth. Be open to receiving the bounty of the universe. This is a great time for medical procedures; your energy will be at a maximum. Native Spirit Wisdom: In the medicine wheel, the south is the direction that symbolizes the warmth of the noon day sun, summertime, the full moon, and a time of rapid growth. Crops grow with vigor during the summer months. In the human cycle, it is also represents the vitality of childhood. This is your time to shine. It’s also time of great bounty in all areas of your Life. Open your arms to receive gifts from the universe. The Journey: stand facing south during the midday. Close your eyes and feel the warmth of the sun opening your heart center. Absorb the sunlight as you sense yourself absorbing the abundance of the universe. 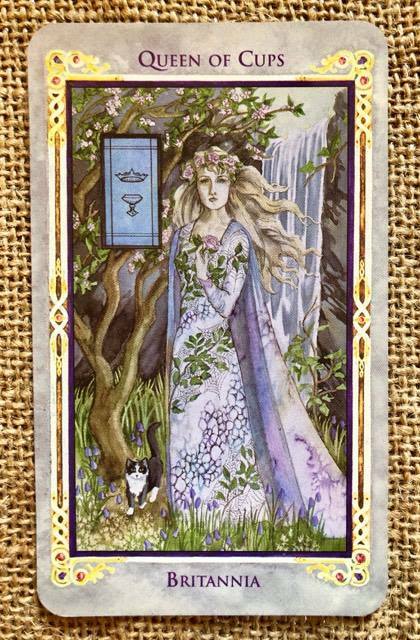 Accompanied by The Green Woman (a time of rich nurturing and protection, of learning and initiation, when loving and fertile relationships, both human and universal, abound) and the Kingfisher (the need to exercise judgment, power, or force of will), the Spark of Life is potent card to start off the week (and spring time). Both skill and cooperation with nature is indicated. Against a shimmering background of leaves and beaches, a stout, rough-hewn hunting bow shimmers with the fire of life itself. The tip of an arrow rests on a heap of kindling chaff, and curled bark is bursting into flame as the tip flashes with brilliant incandescent light. Meaning: As the turning of the cosmic axis generates the spark of life, so the kindling of a flame sparks the necessary light and warmth in our lives. The drill-bow suggests the human element, our partnership with the environment in which we live and the mastery of its gifts. Reading Points: By shaping, directing, and persevering with the tool that both hunts and nutures fire, we kindle the spark that starts the process of creation and empowerment. This takes skill, effort, commitment, and persistence, but the universe always responds with enlightenment, challenge, and opportunity. This is the nature of the human relationship with creation, and leads to a deeper awareness of the part we must play in the great scheme of things. Harnessing the energy inherent in the bow, and the skill and endurance needed to loose the hunter’s arrows accurately and efficiently, are as primal and ancient as human existence itself. Every native tribe on Earth developed the bow as a tool and choosing, shaping, and tuning the bow stave and the arrows is a time-consuming and demanding craft that hones our skills and widens our knowledge of all the materials required in the ancient art. This also includes the habits and patterns of nature associated with the prey the hunter seeks and may infuse the archer with a new respect and reverence for the creatures that inhabit the Wildwood. Be prepared to learn new skills, adapt to a changing environment, and focus and tune your instincts to the task at hand.